Released: December 21, 2011. Directed by: Brad Bird. Starring: Tom Cruise, Jeremy Renner, Simon Pegg. Runtime: 2h 12 min. Brad Bird directs his first-live action film with Mission: Impossible – Ghost Protocol after doing the great film The Incredibles. I think his sense of humour is one of the reasons this entry has so many funny moments, and another reason is Simon Pegg getting a bigger role as Benji, who’s been newly promoted to field agent. Bird’s humour is shown when Ethan Hunt (Tom Cruise) gets a mission to find files identifying a person of interest called “Cobalt,” from the Moscow Kremlin archives. It’s the usual when Ethan gets the message, but the phone says it’s going to self destruct but it doesn’t, so Ethan goes back and hits it with his hand. The plot itself is good as “Ghost Protocol” is put in place by the President that disavows the entire IMF team because Ethan and his team, including Benji and Jane Carter (Paula Patton), are implicated in the bombing at the Kremlin. Also helping them is intelligence analyst William Brandt (Jeremy Renner), and his character’s super interesting. The villain played by Michael Nyqvist is good. The action’s thrilling, too, especially the stunt outside of the world’s tallest building, Dubai’s Burj Khalif. The film’s prison break at the beginning is also such a great opening. Released: July 31, 2015. Directed by: Christopher McQuarrie. Starring: Tom Cruise, Rebecca Ferguson, Jeremy Renner. Runtime: 2h 11 min. The idea of a shadow organization like the IMF is such a cool idea. It’s awesome watching Ethan try to take them down, and there are a lot of cool plot twists throughout. Solomon Lane (Sean Harris) is also a good villain, and his speaking voice is so damn cool. New character Isla Faust (Rebecca Ferguson) has a great dynamic with Hunt, and she keeps us guessing throughout. Mission: Impossible – Rogue Nation is just so bonkers it starts with Tom Cruise hanging off an airplane. It’s one of the best stunts but the film is very entertaining. The film’s set pieces really continue to astound, especially the car chases. One notable scene at an opera makes the opera look like a lot of fun, so that’s a mission it also accomplishes. Released: January 17, 2014. Directed by: Kenneth Branagh. Starring: Chris Pine, Keira Knightley, Kevin Costner. Runtime: 105 min. 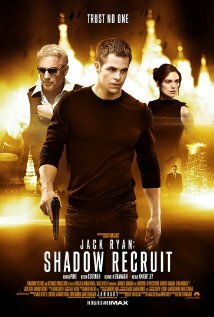 “Jack Ryan: Shadow Recruit” is one of those films that is simply a decent time at the movies; take it or leave it. It has similar action to a lot of other CIA actioners, with an A-list star playing a big name character. Granted, the name Jack Ryan isn’t as big as James Bond or Jason Bourne – but it’s recognizable, nonetheless. This is the fifth film with the Jack Ryan character created by Tom Clancy. I didn’t realize there were so many Jack Ryan movies, but this is a prequel to them all. This is when he is recruited by the CIA. He spends quite a few years as a simple covert CIA analyst, but he becomes an operational agent when he stumbles upon a Russian terrorist plot to destroy the American economy. Before becoming a CIA analyst, Ryan was an active duty officer in the U.S. Marine Corps, where he suffered an injury to his leg after his helicopter was shot down. I thought this might add an interesting layer to the character, because he might feel the need to push himself extra hard to prove himself because he had to overcome the injury; no such luck. It’s used as a tool to provide a bit more background information of the character, and so he can meet his love interest Cathy Muller (Keira Knightley). She becomes entangled in the danger of the situation when she surprises Jack in Moscow, Russia – where he’s stationed, to audit the main villain of the film, Viktor Cherevin (Kenneth Branagh) because of mysterious stocks that the CIA cannot access. It’s fairly easy to follow, especially when Thomas Harper (Kevin Costner) tells Jack to explain it like he does not have his high education; basically saying, keep it simple. It’s amusing when films use that sort-of dialogue, because it helps the audience understand it better, too – and it seems to me that’s exactly why the dialogue is structured that way. The plot’s the basic ‘stop the terrorists’ approach with some sub-plots that make sense by the end of it all. It’s a decent amount of fun because of Branagh’s direction of a few great action sequences (most notably the finale) and a suspenseful recon mission. He makes an interesting choice where his character is walking away from a building and he puts on his sunglasses. In action movies, you might as well expect someone to walk away all cool from an exploding building while putting sunglasses on. He put his sunglasses on, but the explosion never came; brilliant! Branagh’s direction is better than his performance because his character is generally lackluster. The film’s not the fastest getting into it but when Jack kills someone in self-defense and then explains what the villains might be up to, it speeds up quite a lot. Apparently, this is also a mystery as well as an actioner, as far as the people at IMDb are concerned; but it’s not much of a mystery at all. It’s pretty straight-forward. Anyway, at least the main character keeps the film interesting when the action isn’t going on. The relationship shared between Jack and Cathy is one of those where everything is complicated because he can’t tell her that he is working in the CIA. He can only tell her if they wed, but she doesn’t want to marry him just yet for whatever reason – even though she loves him. Since it’s never really clear why she’s so stubborn about the whole marriage thing, it makes their chemistry a bit harder to grasp onto, and it’s more difficult for them to have great chemistry when he has to be so secretive. It’s funny that these heroes always have a love interest; they must enjoy making it easier for the villain to have a Plan B to use the loved one against the hero or however they go about it. Keira Knightley is good in her role, because she isn’t sure whether to expect Jack of cheating or not. Chris Pine is decent as Jack Ryan, the hero of our film. Pine is charming, but he has not been particularly noteworthy outside of the “Star Trek” films, at least what I have seen of him. Since I have not seen the other four Jack Ryan films, I am not sure if he’s better than Alec Baldwin, Harrison Ford or Ben Affleck. As a reboot film, and a fun actioner – it’s a decent watch. Wait a minute, wait a minute! Who’s Jack Frost, again…? Is he that one guy that’s always nipping at everyone’s noses? When a forgotten bogeyman from the Dark Ages called Pitch launches an assault of fear on earth, the Immortal Guardians are all called to fight off against him to maintain the innocence of children all over the world. The beginning feels sort of like one student in high school is trying to write a report, but they’re having trouble organizing their thoughts. That being said, the beginning is an introduction to the characters which feels a bit disorganized. Though, after a small amount of time, it finds its pace and the story just gets better and better. This is a great time of year to try to build up the spirits of children everywhere. This is brilliant because this time around, it is not all about Ole’ Saint Nicolas. Everyone gets their chance to shine in this. The Guardians are just great, and they give all the figures, that children believe in, the chance to show their flares. There’s of course Santa Claus, but this time around he has a funky Russian-esque accent offered by the voicework of Alec Baldwin. He is pretty traditional looking, but he also seems pretty edgy because of his ‘Naughty’ and ‘Nice’ tattoos on his forearms. He offers some insight onto who’s actually making the toys at the North Pole. Apparently, it’s a bunch of Yeti’s, they only make the pointy-hatted elves think they’re making the toys. Who knew? There’s also the Easter Bunny. Hop was the last Easter-themed flick, but the Guardians‘ Bunny makes the little Easter Bunny from Hop look very ordinary. Here, Hugh Jackman offers some great voicework to this character, and in the process he makes him Australian. He’s a six foot-two Easter Bunny that has a sweet boomarang, that makes him feel like he just stepped out of a video game. There’s the Tooth Fairy, voiced by the beautiful Isla Fisher, who’s a mix between human and hummingbird. There’s also the mute Sandman (who isn’t voiced by anyone, the studio dodged a bullet casting this guy) who communicates with symbols and funny gestures. There isn’t any explanation necessary on what these two do. Though, this next character, you might need a little introduction to him. The new Guardian in town is the wayward Jack Frost (voiced by Chris Pine). No, not anything like a snowman or Martin Short’s version of him. All Jack wants to do is cause snow days and havoc, but he wants to have a little fun while doing it. He constantly wonders of his true destiny, and he is a character that knows what it feels like to be invisible. Another character that knows what it feels like to be ostracized and forgotten is the film’s main antagonist, Pitch Black (voiced by Jude Law). Pitch is a jagged-toothed Bogeyman that wants to instill fear in the hearts of children everywhere. His main motivation of doing this is so he can teach the Immortal Guardians the feeling of loneliness and invisibility he has felt for hundreds of years. He wants to be the big guy on campus for once. Pitch’s main rivals are both Jack Frost and the Sandman. When Pitch steals Frost’s memory of a former life, Frost’s motivation is to retrieve this very valuable material. Frost is also on the fence about his destiny, and he relates to Pitch from time to time because he, too, knows what it feels like to be overlooked because of his juvenile behaviour. The main conflict between Sandy and Pitch is simple. The Sandman brings happy dreams to the children of the world, while Pitch brings dark nightmares. Sandy is obviously not very happy about this, and you won’t like him when he’s angry. However, these are not the only conflicts – the characters are all given their time to shine, so it never feels as if there is one primary character. There was a concept that came to mind when both the characters of Pitch and Man on the Moon (the moon practically, it’s like God to the Guardians) were initially introduced. It brought to mind the concept of how Lucifer was cast out of Heaven by God, because he wanted to be the head honcho. A plot point that I attempted to predict is that Pitch may have once been a Guardian, but then he was cast down because he was turning evil. That’s just a thought that came to mind because of the good vs. evil forces. The message is one of the finest in animated films this year: if you believe, it will overcome all fear. It’s greatly displayed in this family film. Like Monsters, Inc. was with Pixar, this DreamWorks’ edgy children’s and family film. It’s a sort of strange concept that works pretty well. Pitch, the Bogeyman, is sometimes depicted so ominously, it might be a little too hard to handle for the smaller children. There is also some thematic material that can get quite dark. However, there is enough innocent humour to level it all out. The 3D effects are sometimes gimmicky, but that’s okay. While it is sometimes gimmicky, there are also many cool effects that bring very inventive animation to life even more vibrantly. 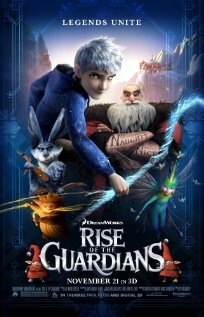 Rise of the Guardians is a slightly flawed animated adventure that may have some deeply thematic material and action sequences that could be midly scary for small children. The main flaw is the beginning, because it feels disorganized – but it finds its pace soon enough. The story is wildly inventive, as are the alterations of the beloved Guardians. It’s a great thing to teach the kids this holiday season – don’t just believe in Santa Claus, believe in the other figures too, when their time of year comes around, at least.